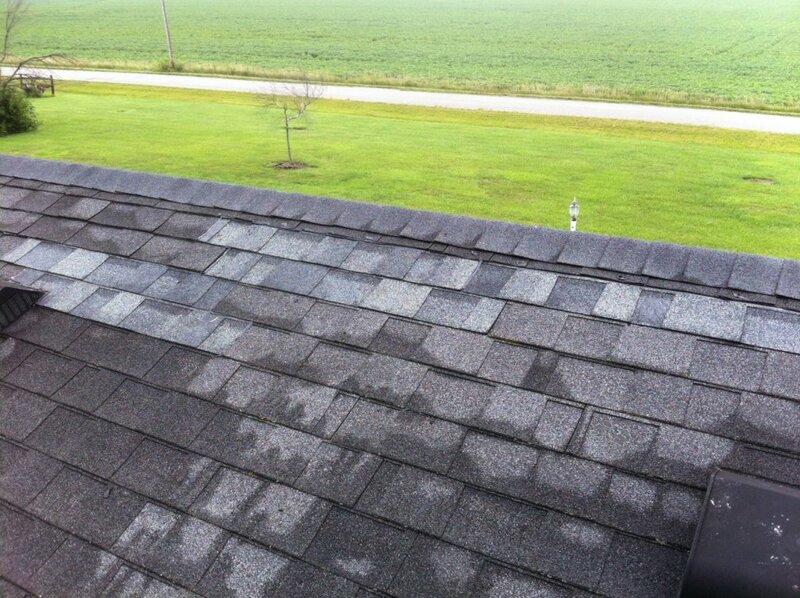 Recently, I was asked to repair a roof on a ranch home near Antwerp – the homeowner said they had lost some shingles in a wind storm. 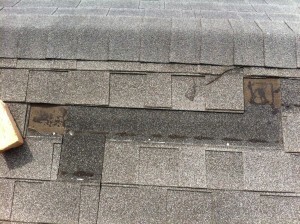 Typically, this means that a roof has been neglected and is far beyond its expected timeline (buckling shingles, major shrinkage, and valleys that are all but destroyed). 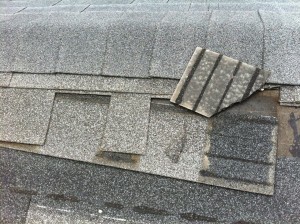 Not the case with this one, as the roof looked fairly immaculate and could not have been more than ten years old. 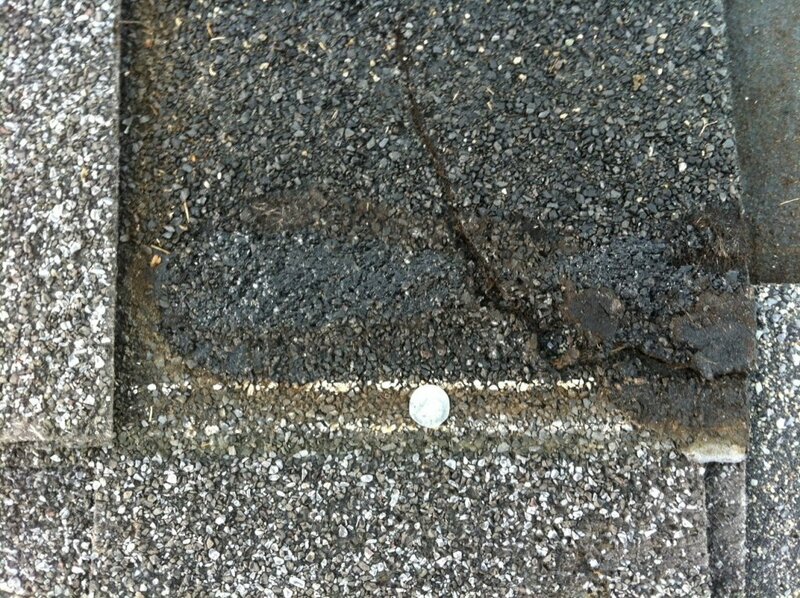 The homeowner explained that a fairly large roofing company out of Paulding had completed the roof in the late nineties, and the shingles they installed were PINNACLE. I was not surprised. He went on to explain that only a couple years after he had the roof installed, the entire front section had blown off and had to be replaced by the company (you can see the slight color differences between each side). 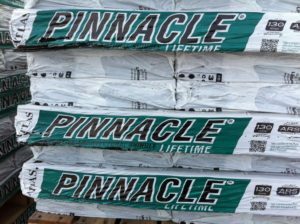 This is not the first time I’ve heard stories from folks who have installed these Pinnacle shingles – inferior shingles and poor customer service. 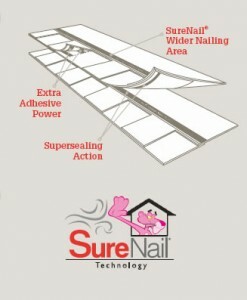 One, they have a super wide nailing strip with “SureNail” technology. What is “SureNail” technology? The nailing strip is covered by a thick woven, fibrous material that makes it virtually impossible to pull the nail head through, even if you wanted to. What this means – you are covered with a 130 MPH wind warranty with this product. When was the last time you clocked 130 MPH winds at your home?? 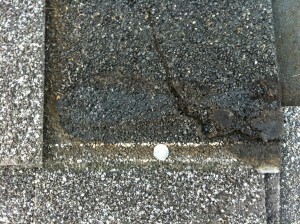 Likewise, the extra width of the nailing strip (about 1 1/4″) ensures that every nail is placed properly. 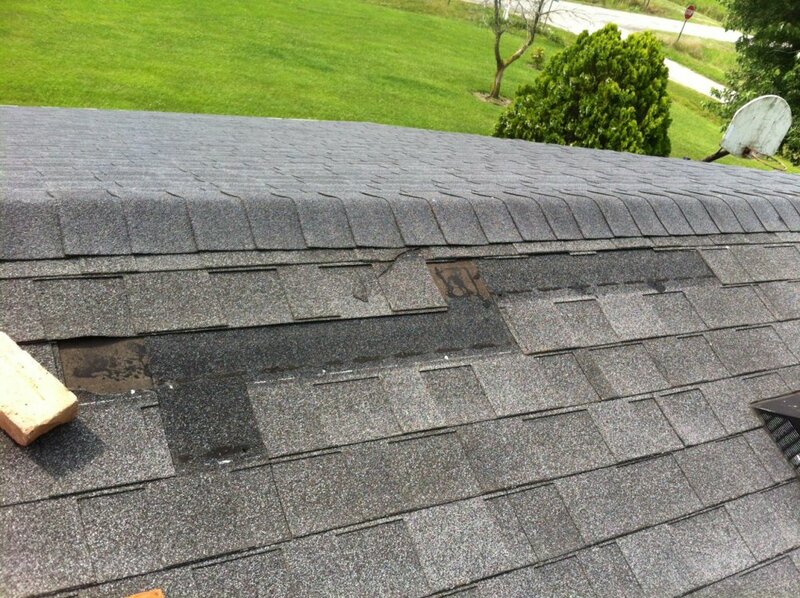 If you look at the pictures of the Pinnacle shingles below, the nailing “strip” is indicated by two faded white lines, and is only about 3/8″ wide. 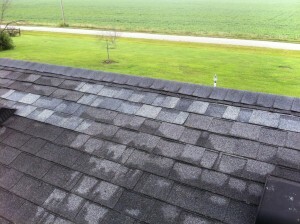 It is a barely attainable target for even the most skilled roofer. 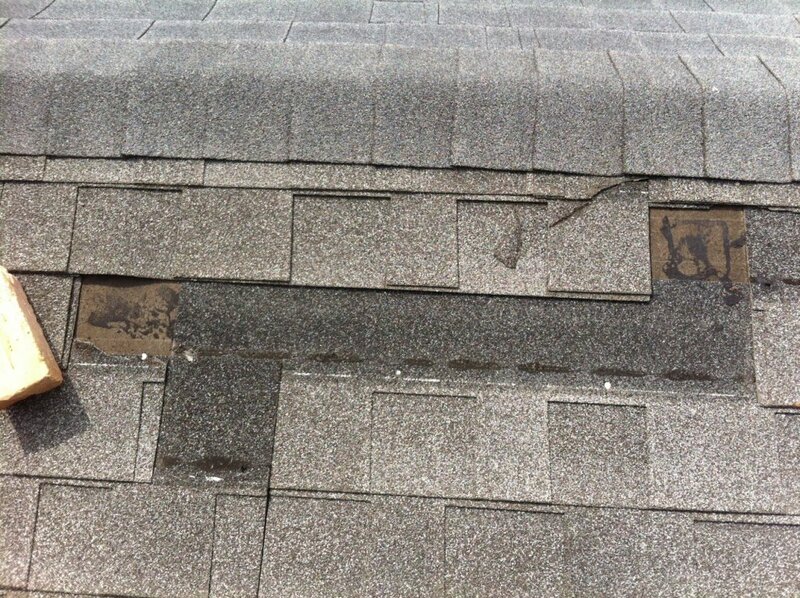 You can see how the previous roofers nailed about half inch above the recommended nailing lines, and the shingles ripped up right at that spot. Two, Owens Corning Duration shingles have a super sealing tar line, and when they say “super sealing,” they mean it. 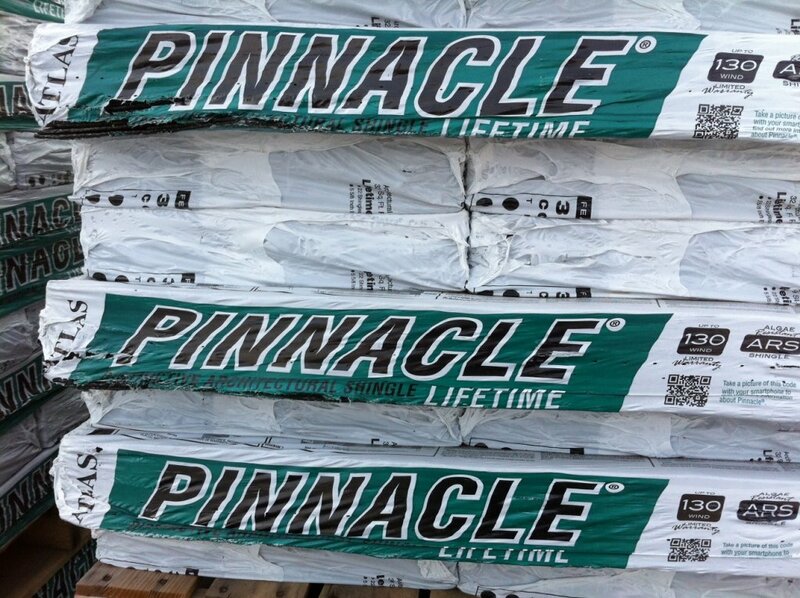 While other shingles require a good 80 degree sunny day to properly seal, these Owens Corning shingles will seal almost immediately with 55 degrees and only moderate sun. Believe me, when they seal, they really seal! Three, Owens Corning Duration shingles have an extra adhesive bond to keep the laminate portions together. 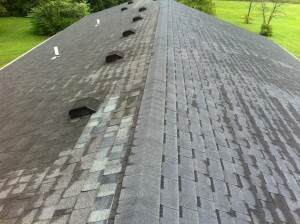 If you look at the pictures of the Pinnacle shingles below, it is clear that the laminate areas have failed. They pulled apart with only minimal effort.